Tagline: "The #1 novel of the year - now a motion picture!" 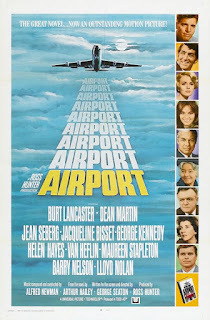 Released in 1970, Airport set the stage for that decade’s other big-budget disaster films, and thanks to its star-studded cast and a plethora of thrills the movie even managed to garner a whopping 10 Academy Award nominations, including one for Best Picture (which it lost to Patton). With a fierce snowstorm raging outside, Mel Bakersfeld (Burt Lancaster), the top dog at Chicago’s Lincoln International Airport, has been working non-stop for days to ensure his airport runs as smoothly as possible. But it hasn’t been easy. For one, a Boeing 707 belonging to Trans Global Airlines took a turn too quickly on runway 29 and is now stuck in the snow, forcing all traffic to be diverted to runway 22. In addition, Bakerfeld’s brother-in-law, pilot Vernon Demerest (Dean Martin), has been openly critical of how the airport is being run during this emergency, and has sent a report to the Board of Operations detailing his concerns. Then, on top of everything else, there’s a good chance that D.O. Guerrero (Van Helfin), a passenger on a Trans Global flight to Rome (piloted by Capt. Demerest himself), is carrying a bomb in his briefcase, which he intends to detonate once the aircraft is over the ocean. With hundreds of lives at stake, Bakersfeld, Demerest and their team must work quickly to turn the plane around and, if possible, subdue Guerrero before he flips the switch. But can they do so without raising the suspicions of the already-nervous would-be bomber? The first half of Airport is dedicated to building its characters. Lancaster’s Mel Bakersfeld essentially runs the airport, and his long hours have led to some friction between him and his estranged wife Cindy (played by Dana Wynter). During the storm, Bakersfeld has spent a great deal of time in the company of co-worker Tanya Livingston (Jean Seberg), and has discovered that he’s developed feelings for her as well. As for Bakersfeld's brother-in-law, Vern, he's having an affair with pretty young stewardess Gwen (Jacqueline Bisset), who shocks the hell out of the philandering pilot with a little announcement right before their flight to Rome takes off.We even get to know the wannabe saboteur, Guerrero, an unemployed construction worker with money troubles who hopes a large insurance policy will finally give his long-suffering wife Inez (Maureen Stapleton) the kind of life she deserves. The main actors, as well as the supporting cast (especially Barry Nelson as Vern's co-pilot Anson Harris, who plays an important part in the films second half), do a fine job fleshing out the movie’s many characters. In addition to its personal dilemmas, Airport reveals, quite convincingly, how difficult it must be to keep an airport operational during a snowstorm. Along with the plane blocking runway 29, which top technician Joe Petroni (George Kennedy) is trying to movie, Tanya must deal with a stowaway on a recent Trans Global flight from L.A., an elderly woman named Ada Quonsett (Helen Hayes, who won an Oscar for her performance). If Ms. Quonsett is to be believed, she’s been sneaking onto flights for years to visit her daughter in New York. Then there’s the problem with runway 22, which is situated next to a small neighborhood. The residents of this community are none too happy that planes are landing so close to their homes, and have threatened to file a $10 million dollar lawsuit if the runway isn’t closed by midnight. As with the characters, these various subplots are engaging enough to keep us watching Airport until the main story gets underway. Which happens soon after the flight to Rome takes off; Mel, Tanya and a few others figure out what Guerrero is up to, and alert Capt. Demerest and his crew, who now have to get the upper hand on the would-be bomber without causing a panic among the other passengers. It’s a tension-riddled second half, and thanks to all that went before it, we’re pulling for everyone to make it out of this predicament alive. By focusing as much as it does on its story’s dramatic elements, Airport isn’t as action-packed as the disaster-themed films that followed in its wake, such as The Poseidon Adventure, The Towering Inferno, and Earthquake. But this 1970 movie is still plenty entertaining, and there’s no denying it got the genre off on the right foot.